Protect your property from environmental hazards. Choose AF Environmental for safe asbestos removal. Asbestos was a common building material prior to the 1980’s. Used in virtually everything, it was the mineral of choice due to its strength and heat resistance. It was used for centuries until asbestos was linked to some serious health risks. Researchers found a direct link between asbestos’ small mineral fibers and chronic disease such as mesothelioma and asbestosis. Proper asbestos abatement is critical before demolition projects on older structures. For your home or business, it is essential to choose a highly qualified, licensed company to handle the abatement process. AF Environmental has a successful process in place to encapsulate, remove and abate asbestos ridden areas. Regardless if asbestos is found in your home or business, our process will ensure the abatement process will be done in a safe and efficient manner. Equipped with the proper tools and equipment, our team can successfully remove dangerous asbestos without serious disruption to your daily routine. In fact, we can assist on even the most complex environmental restoration projects. At AF Environmental, we hold the proper state licensing for asbestos abatement projects of $1M value or greater. AF Environmental services the Dallas/ Ft. Worth metro area. Established in 2004, our service area includes but is not limited to the counties of Tarrant, Parker, Dallas, Denton, Collin, and Johnson. AF Environmental breaks down the asbestos abatement process into three stages. EPA laws and regulations provide guidelines to ensure proper safety is addressed during the abatement process. Safety is our number one priority when working with asbestos. That is why we take special precautions to ensure the abatement process coincides with EPA regulations, while keeping all occupants safe. Containment- For asbestos abatement projects, we build a triple cell containment structure for optimal protection. We build a clean room, decontamination room and an abatement room. This ensures small asbestos fibers or particulates are contained in a controlled area. Negative Pressure- Once containment is established, we will seal off all HVAC vents, windows and doors. We will then place negative air machines in the space to keep contaminants secured. These machines are equipped with HEPA filters that remove 99.95% of dust and particulates. Removal– This step is the nuts and bolts of the abatement process. Here, our technicians will wet down any asbestos ridden materials to ensure dust particulates do not spread during the disposal process. Sterilization- Once the damaged materials are removed, all surfaces are cleaned and decontaminated via wet/dry HEPA vacuums and high-powered cleaning solutions. Upon the completion of asbestos removal, the contained area will remain in place until testing can be done. The test consists of a combination of air sampling and visual testing, taking samples to verify if abatement has been complete. The samples are then sent to a laboratory off-site who will determine if the project is free of asbestos or not. Within 24 hours receipt of the written testing report, our technicians will return and begin the process of containment removal. Proper timing depends on when we receive the report and proper access to the property. Once the containment is removed, it will signal the asbestos abatement has been complete, and any other phases of the project- such as reconstruction, demolition or restoration services can begin. 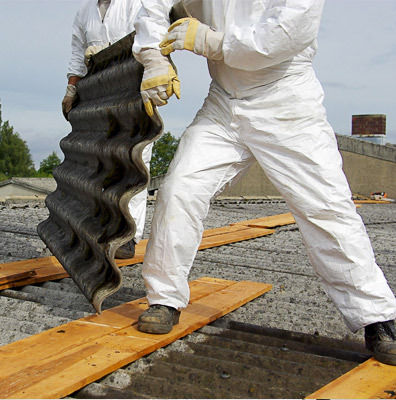 It can be difficult to find an asbestos abatement company who can take on projects of all sizes. We are one of the few companieswho are licensed and qualified by the State of Texas to take on abatement projects of $1M or more. Available 24/7, AF Environmental has worked with both home and businessowners to restore their properties after discovering harmful asbestos ridden building materials.